WMCN 91.7 FM, Macalester's college radio station, compiled and released a playlist today that serves as a great snapshot of the local scene here in the Twin Cities, including two of our own: Prissy Clerks and Nice Purse. 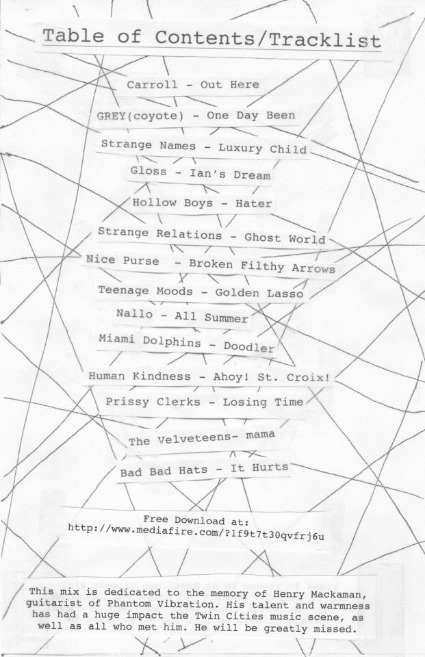 The playlist will also have a 14-page companion zine, which will be available at locals coffee shows, record stores, etc. Perhaps most importantly, the playlist is dedicated to the memory of Phantom Vibration guitarist Henry Mackaman, who recently passed away. While Phantom Vibration is not a direct part of Forged Artifacts family, they were an integral part of our local community and Henry will undoubtedly be missed. I want to take this opportunity to link to some Phantom Vibration's page, so you can experience their sounds, and Henry's talent, for yourself. VIDEO: PRISSY CLERKS - "BLAST-OFF GIRLS"